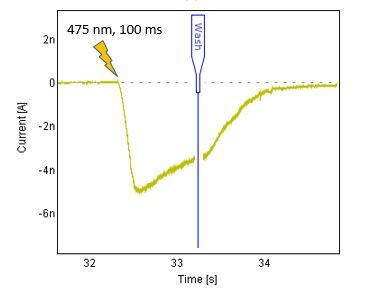 With the new optical capability of Qube Opto in combination with the microfluidic system of the QChip, the exposure time of a ligand can be drastically reduced. Here we use rubi-GABA, a caged GABA compound, and demonstrate two strategies to obtain short ligand exposure. When 1mM RuBi-GABA is washed in, no response is seen, as the caged GABA does not activate the GABA receptors. 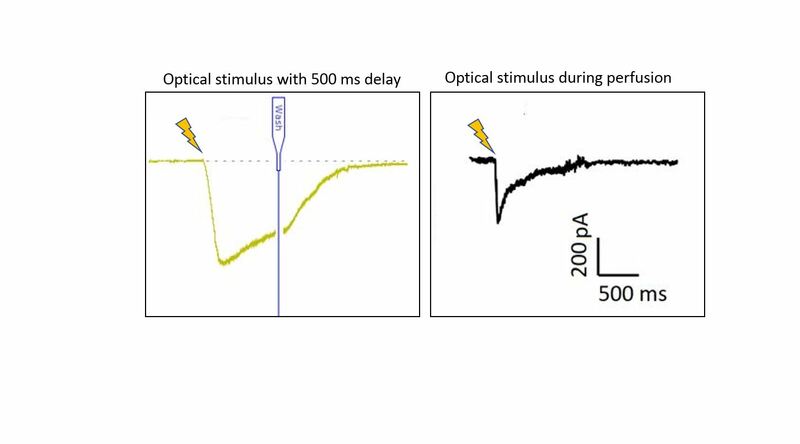 Upon stimulation with light for 100 ms, GABA is uncaged and activates the GABAA receptor. 500 ms after the stimulus, the microfluidic channel is flushed, the response terminated, and the channels are completely deactivated. To further decrease the ligand exposure time, the light stimulation was executed during perfusion with RuBi-GABA. 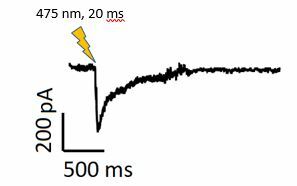 The uncaged GABA was instantaneously washed out, and in combination with a shortening of the light stimulus to 20ms, a sharp, ultrashort GABA response was recorded with an exposure time approaching that of a synaptic response.